Bean Creek Road has it all for remote country roads. Cool and refreshing in the morning. Yes, I took a bus to Scotts Valley this morning so I could enjoy my ride. That means fewer miles. 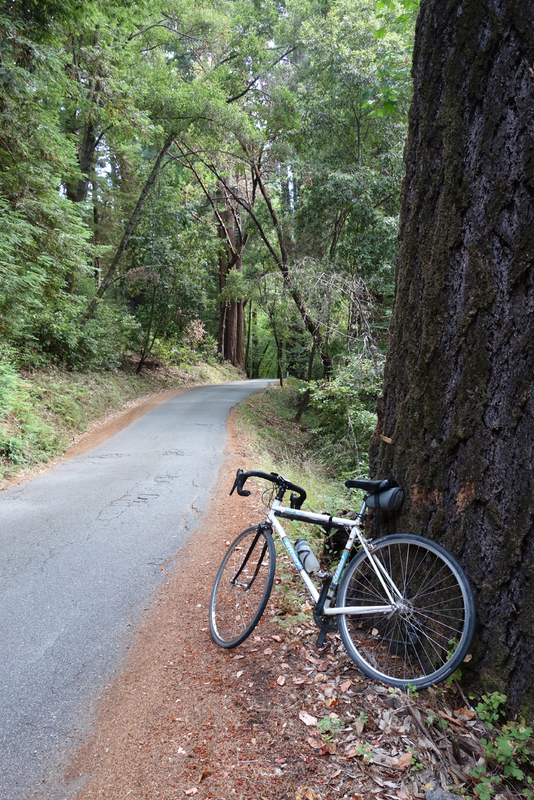 In the days of yore, we’d ride from Palo Alto over to the coast, then back up Mountain Charlie Road, Summit Road, Skyline. It was a long day. Jobst Brandt led the way and kept things interesting. Taking the Highway 17 Express from Diridon Station was a close thing. It carries three bikes. I was bike number three. A fourth rider wasn’t allowed to bring on his bike. Rules are rules. I can’t tell you how much more enjoyable it is riding up steep roads with fresh legs. I could enjoy the climbs without suffering. Silo house on Mountain Charlie Road. After the Mountain Charlie Road climb, I can say with certainty that the hardest part is the section before the blue silo house. The Old Japanese Road section is not as difficult. Summit Road has some stiff climbs, but they’re a shade easier than Mountain Charlie, topping out at 15 percent. The first 0.4 miles after leaving the Bear Creek Road junction have been paved, long sections of guardrail added and hillsides reinforced. One of the reasons I like this ride is the lack of car traffic. It’s sparse, but I’m seeing more cars than I did 30 years ago. 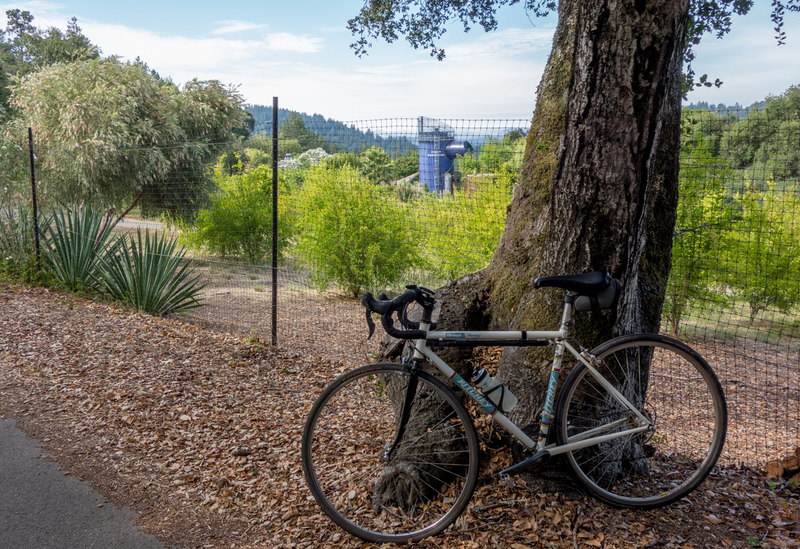 The real problem with cars in the Santa Cruz Mountains is Highway 9, which has become a gateway road where all the traffic goes. Castle Rock State Park is the biggest magnet. Parking lots keep expanding along Skyline. I headed down Hwy 9, but if you’re planning on turning left onto Redwood Gulch Road or Pierce Road, hope for a break in traffic. It’s bad enough now that there’s no guarantee you can make a safe turn. A grim reminder that Mountain Charlie Road needs ongoing maintenance. All of this reminds me of Marin County and Panoramic Highway. If you want to see the future on Hwy 9, this is it. Panoramic Hwy is lined with cars for miles, everyone trying to get to Muir Woods. Looking out to the Pacific Ocean and a layer of brown haze reminded me of how lucky we are here. Forest fires are a rarity in the Santa Cruz Mountains, thanks to the fog. Let’s hope it stays that way. This entry was posted on July 29, 2018 at 7:47 pm and is filed under Ride reports. You can follow any responses to this entry through the RSS 2.0 feed. You can leave a response, or trackback from your own site.